Recently I have renamed my blog to “The Sceptical Economist”. Partly, it is an ironic allusion to the self-called Skeptical* Environmentalist Bjørn Lomborg. Another reason for choosing this name is my dedication to rationality, pragmatism and scepticism – the foundation I try to base my worldview on. The last reason rationalizing my choice is my deep scepticism toward the dominant orthodoxy in the discipline I’m trained in – economics. This last reason I would like to explain more comprehensively today. It is not very easy to define what “orthodoxy” is in economics since the discipline is evolving steadily. However, there are some presumptions, basic ideas that have proved rather stable over the years. A few of them are wrong, though. In addition to those, I shall comment on some which are not necessarily that dominant and persistent, but nonetheless present in most economics textbooks, at least implicitly. I do not claim for my list of the economics’s wrongs to be exhaustive. There are too many aspects of economics that determine its “general direction” (it is a complex, dynamic system of sorts) for a blog post to be a sufficient arena to cover and critically analyse all of them. But I do think that the points I choose to criticise are important and, indeed, central to the modern picture of economics as a dominant discipline in the capitalist world. The rationale for being a sceptical economist or a lay person sceptical of economics can be differentiated into four gross categories: the neglect of the non-market world; homo oeconomicus and the (mis-)understanding of human motives and behaviour; the glorification of growth and globalization; and anti-democratic tendencies. For starters: there is no place for home work in mainstream economics. Since cooking, cleaning etc. done at one’s own home does not involve market transactions, it is implicitly deemed worthless in the economist’s calculus. We are being told by the disciples of economic theory that a rise in GDP is (always) a good thing. But GDP may increase as the result of a switch from home work to paid services. Indeed, this is part of the reason why the U.S. has much higher GDP and lower unemployment rates than European countries do. US-Americans do not wash their clothes themselves, they do not cook etc., but let far more often others do those things for them – against pay, of course. Does that mean that US-Americans are better off that, say, Germans? I doubt that. Also, barter-like transactions are not of concern for economics. If my neighbour repairs my bike and I give him some of the vegetables grown in my garden in return, this is a transaction enhancing our both’s well-being, often also being very efficient – but since no money has changed pockets and no contract was set up, this transaction is non-existent from the economist’s perspective, let alone its beneficial impact on community (or social capital – we will come back to it later on). While there are voices calling for changes in economic accounting practice to live up to these issues, common practice has not embraced them yet. A similar issue is how conventional economics treats natural capital. Those few natural goods dealt in markets (wood, game, wild fruits…) are being “counted”, everything else, viz. pollination, flood protection, habitat etc., is being ignored. This leads to a continuing deterioration of ecosystems, which are the foundation of our very livelihoods. A part-response to this problem is given by those ecologists and ecological economists who try to assign value to ecosystems and the services they provide. But, being one of them, I still think that even we must keep in mind that there are things we cannot count and express in economic terms, which by no means makes them unimportant! One extreme consequence of the economist’s disproportionate focus on markets is that they not only ignore the non-market world, but they also have helped create a non-world market. We are living in a world, in which the volume of purely financial transactions is many times larger than the world GDP (which reflects mainly the production of tangible goods and services). Derivatives (financial products whose market value depends solely on the market value of other financial products), the frictional banking system (commercial banks effectively creating “virtual” money by giving to people “money” as loans they do not actually have), much of the dealings of stock exchange (when firms gain value only because people think they’re valuable, and the other way around – a self-fulfilling prophecy, indeed) – these are things created by markets which are not any more connected to the real world. Economists care for them, while at the same time ignoring important phenomena of the real world, just because they have nothing to do with markets (but they do have to do with our economic activity, broadly understood). Even though economists increasingly acknowledge that we are not rational, selfish and well-informed, as their models mostly assume, they nevertheless keep using models based on these assumptions. This is the reason why, e.g., orthodox economics cannot convincingly explain such phenomena as nonprofit organizations or open-source software. They do try to, but mostly fail to give a convincing explanation of the whole phenomenon, just being able to analyse some of its parts (see, e.g., The Comingled Code by Josh Lerner and Mark Shankerman). Why should a rational being whose utility function depends solely on what he or she “gets” commit his or her time and knowledge and skills to a project rewarding others? Another, closely related failure of economics is the neglect of the notion of social capital. This economically sounding term was coined and developed primarily by political scientists (most notably by Robert Putnam and the late Elinor Ostrom). It stresses the obvious fact that we are social beings, the importance of social bonds, norms and collectively formed value systems to our actions, our motivation and our well-being. Meanwhile, conventional economics is individualistic to the point of absurdity – it assumes, explicitly or implicitly, that economic actors are encapsulated entities dependent on themselves only. The rich literature on social capital is an attempt to prove this heuristic assumption wrong and to develop alternatives. A third aspect of our psyche economists get wrong is hidden behind the very popular notion of “love of variety”. The underlying idea is that we like being able to choose the products and services that most suit our tastes and that we appreciate the breadth of the offer. This is right, but the problem is that there is no limit to it in this assumption (paraphrasing a famous Polish philosopher: “Every idea, if handled truly consistently, is becoming its own contradiction.”) – 100 different sorts of, say, ketchup to choose from are assumed to be better than 10 sorts. But is there really no saturation point? The psychologist Barry Schwartz is one of those who have questioned this assumption, as he came up with the “Paradox of Choice“: yes, we appreciate having a spectrum of products to choose from, but if the spectrum is becoming too broad we are soon becoming overwhelmed. Which is, by the way, astonishingly similar to what Richard Easterlin observed with regard to income – beyond a certain level of income, further growth in it does not make us happier. The insatiable, variety loving, encapsulated homo oeconomicus is too much of a simplification to be a useful model of human behaviour. I already have written at length on the subject of economic growth and have explained repeatedly why I do not buy the economist’s “wisdom” that we need growth and that it is good for us (see, e.g., here, here or here). Of similar nature is my opposition to the termless glorification of economic globalization (understood as growing international trade volume, increasing market share of transnational corporations and increasingly export-oriented economies). To be sure: a certain level of globalization may well be beneficial. But beyond some point (again – economists seem to have problems acknowledging limits to their ideas) it is creating dependency, instability, destruction of ecosystems due to the uncounted for environmental costs of trade, among others, and social problems as a result of the race-to-the-bottom fight for comparative advantage. However, hardly any economist would acknowledge these detrimental factors of globalization, with the notable exceptions of Dani Rodrik and some ecological economists. Both globalization and economic growth are, however, the holy cows of conventional economics. This point of my critique may well be the one economists would be eager the least to accept. Another holy cow of economics is efficiency. 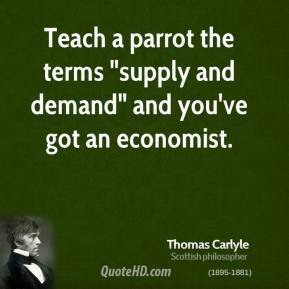 As economics is a discipline dealing with scarcity, this is a good thing indeed. The problem is that economists often refuse to include or at least recognize other criteria in their analyses. For example, while welfare economists have “officially” accepted that equity is also something to care for, this is mostly done by invoking the so-called Kaldor-Hicks criterion: an increase in the aggregated welfare (=mostly, income) of a group is efficient if there exists the potential [sic!] possibility of compensating the losers within the group. In more formal terms, there is only need for a potential Pareto improvement. Whether this compensation will ever take place is not the economist’s problem, even if the increase in overall welfare is due to a company increasing its profits through lowering labour costs (if additional profits > aggregated income loss by workers) – it still has the potential possibility to compensate the workers. But why is this anti-democratic? One reason has already be named above – by focusing on Kaldor-Hicks efficiency economics legitimates increases in inequality, resulting all too often in imbalances of political power (99 vs. 1%). Another reason is the legal form of enterprises that is promoted by the criterion of efficiency. It is a fact that, according to common criteria, corporations are generally more efficient than, say, cooperatives or associations. But while the latter are inherently democratic, giving every member the same power in decision-making processes regardless of their wealth, in corporations those are “in charge” who have the money. This is not really what we call democracy, but it has important implications for society as a whole, e.g. when corporations dominated by a small group of rich individuals lobby for their vested interests. All in the name of efficiency. As I stressed in the beginning, I do not think my list is comprehensive. But I think it is comprehensive enough to support my point: be sceptical of economics. * – I prefer British spelling.